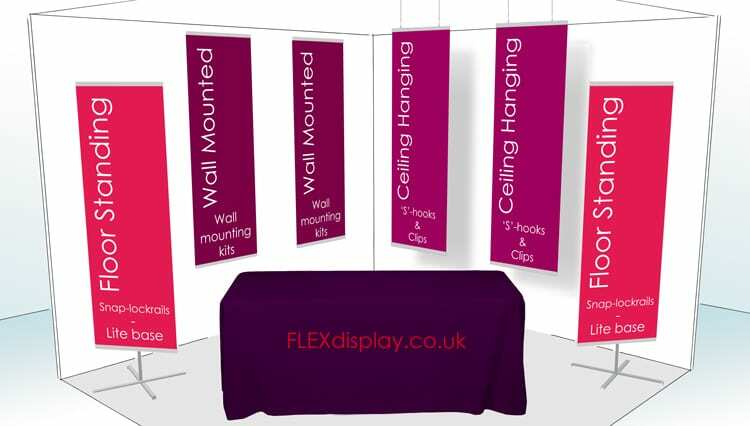 The FLEX-display system components are built to be highly modular… Our rails work with our free-standing banners as well as ceiling and wall mounting kits. This means that if you already have a banner hardware and want to reuse the graphics, the banner can be used in a shop/office either hanging from the ceiling or simply mounted on a wall. For our floor-standing banner range – Click here. Our snap-lock rails can be used with our simple ceiling mounting kits – consisting of ‘S’-hooks and clips – the system allows your banner to be hung from a ceiling (or over the side of an exhibition stand) when there is restricted floor space. The hanging kit are also regularly used in shop window displays – Which proves an very elegant display coupled with our vibrant printed fabric graphics. Similarly, our wall fixing kit allows your banner to be displayed on a wall. This is particularly advantageous to get the most use out of a single graphic (for instance, after an exhibition or show, the fabric banner can be mounted on the walls of office space).